What is an online college president? Just because a school offers its students the ease of attending classes online, does not mean that the school itself doesn’t need the same personnel as any other, and this includes a competent president. An online college president has most of the responsibilities of a brick-and-mortar university head, with the added complexity of overseeing a vast computer network. 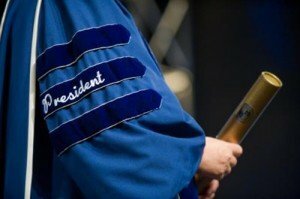 An online college president can be the Chief Executive Officer of the entire university or may simply be in charge of one branch of the school. His or her responsibilities can be far ranging and could include setting long-term goals for the institution as a whole, communicating with students and faculty when there are problems and addressing their concerns, deciding what types of courses the school should offer, and hiring the best teachers to design and lead those classes. They may also be called upon to manage the school’s budget and develop its academic policies. The average medium pay for chief executives in all industries, according to the Bureau of Labor Statistics (BLS), is over $165,000 annually. As an online college president, you will find yourself part of a cutting-edge learning revolution. Online study allows people in a variety of family and work situations to attend classes and further their educations from home while accommodating other obligations. This is something traditional schools simply can’t offer their students. You will also be reaching people who live in remote settings and don’t have access to higher education. Furthermore, while you will have to monitor a huge computer network and the specialists who keep it running, you won’t, like a traditional college president, have to worry about landscaping bills or sewer problems. On the flip side, however, your face-to-face contact with students — and perhaps even staff — will be limited. This can be isolating. You will also have to work hard to ensure that the seemingly impersonal world of distance learning is personalized as much as possible. You will have to introduce yourself and make yourself accessible to your student body through electronic media outlets like Facebook and Twitter. To become an online college president you will need an advanced degree, such as a Master’s Degree or a Doctorate, in business administration, teaching or a related field. Here is how you can get started. Start by finishing high school. Some universities may only ask that you have a GED before you can sign up for their classes; others may require that you have a valid high school diploma. The next step is to earn a Bachelor’s Degree. Whether you choose a traditional university or an online college, make sure the school you wish to attend is accredited. You can pursue a degree in business administration, marketing or education. You will also want to include computer studies in your learning plan. While, as president, you will not be directly responsible for your school’s computer network, understanding the basics will give you the working overview you’ll need when problems arise. Choose computer courses such as introduction to programming, software systems design, or organization of computer systems. Once you have your Bachelor’s Degree, you must go on to earn a Master’s Degree or your Doctorate. If you continue your education at an online university, you will be in the unique position of truly understanding the needs of your students. This could be an advantage both when you apply for a position and when you start your actual job. Becoming an online college president can be the start of a rewarding — and lucrative — career. To learn more about this exciting career choice, fill out our online sign-up form.